The Place When Chef Julien left Jaan to helm the Two Michelin starred Odette, there is some big shoes to fill. 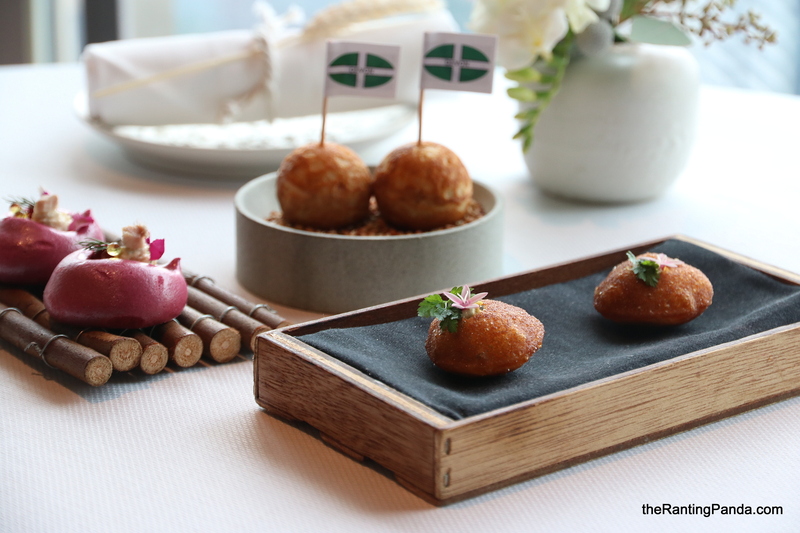 Fortunately, the restaurant at level 70 of Swissotel the Stamford has maintained its high standards under its British Chef de Cuisine Kirk Westaway. Some of the accolades the past few years include its One Michelin Star title, along with a spot on Asia’s 50 Best Restaurants (#32, 2019). The Rantee has dined at Jaan few years back, but it was my first time dining at Jaan proper for a celebratory occasion. Needless to say, I was already looking forward to the meal before my visit, when the reservation was secured few months in advance. It is not a big space, just 40 seaters with about half the tables beside the window where you get a view of the city, including Marina Bay Sands if you are lucky. My recommendation is to request for a window table where possible for the best dining experience. The look of Jaan is simple yet classy and elegant, characterised by its white table top, spacious dark sofa seats and carpeted floor. The Food There’s a seasonal menu at Jaan, as with most fine dining restaurants even as we struggle to imagine there are seasons in Singapore. My visit during lunch coincides with the Autumn menu, where there is the option of either the 5-course menu (S$138++) or the 6-course menu (S$158++) which showcases Chef Kirk’s signature dishes. We decided on the 6-course menu without much hesitation. The first teaser of the meal are for snacks, all presented very beautifully. They are the Beetroot Meringue with Smoked Eel, Buckwheat Pancake with Devon Cheese, Fish and Chips Tarts and Rabbit Pie. The one which surprised me most is the Beetroot meringue, where the texture of the meringue is so light while the beetroot flavour is subtle yet delicious. The Buckwheat pancake with Devonshire cheddar cheese is my other favourite snack where you get the rich and fresh cheese flavour. The next dish is the Mushroom soup, one of those soups which I can drink for very long. The texture is not that creamy but the mushroom flavour is good enough that it is very pleasant to drink it straight from the small bowl. Next up is a huge basket of freshly baked sourdough bread, along with some fresh Devonshire butter which is sliced right beside our table. I always try to control overeating too much of bread, just so that I can enjoy the other courses with an emptier stomach. At this juncture, the meal was just about to start proper with the first course. The previous dishes were merely a prelude, which I’m not ranting about. The first course proper is the Jerusalem Artichoke Custard along with Kristal caviar with soft poached Irish oyster. I’m not the biggest fan of oyster, but this starter is competent enough as depicted by the creamy texture of the poached oyster. The second course is the Organic Heirloom Beetroot decorated with Cured trout egg caviar and Golden beetroot sorbet. It seems like beetroot is strongly featured in the autumn menu, as seen earlier from the snacks. I am most impressed with the golden beetroot sorbet here as it was my first time seeing this type of beetroot. The third course is something which got me excited, the Eggs in an egg. When we heard that this dish uses New Zealand organic eggs, we were instantly reminded of all our brunches during our recent NZ trip. This version is smoked in rosemary, and the egg yolk here is rested on cauliflower custard, Shimeji mushrooms and topped with caviar. It is also served alongside a crispy brioche with Parmesan cheese, an interesting complement to the oozy eggs. The fourth course is the Brill with Artichokes and Capers. The fish flavour is clean and fresh, which contrasted well with the distinct and slightly sweet flavour profile of the artichokes. On to the main course proper, the fifth course is a rather understated looking Sanchoku Wagyu with Onion. The portion is quite tiny, but the intense and well-marbled flavour of the wagyu beef compensates for the size. The meat is very succulent, a reminder of why I still prefer Japanese wagyu beef all these years. Go along with the accompanying grilled onions which are delicious! Before our dessert, we were served the refreshing palate cleanser. For the last course, on the menu is the Pear Tart served with vanilla ice cream and crumbles. It is usually not a dessert which gets me excited, but I am surprised this pear tart resonated well with me. The texture of the tart is crispy, yet the taste of the pear is subtle and beautiful. It is a light touch to end the meal. There is an option for complimentary coffee or tea at the end of the meal to go along with the Petit Fours, which are presented in an elegant white layered box. Rants The prime seats at Jaan are definitely the window seats. With limited tables available, make sure you book your table early to reserve it. Will I Return Again? Jaan impresses me with its understated elegance, be it the dining ambience or the conceptualisation of its menu. The dishes are consistent in terms of standards, pacing of the courses are well-times and the service is professional. If you are thinking to splurge on a fine dining experience, this is one restaurant to go for. Snapper Bouillabaisse from the revamped menu at One Ninety restaurant in @FSSingapore. This Provencal fish is packed with red snapper, mussels, tiger prawns and clams. The orange broth is slightly spicy, packed with herbs and spices along with spicy daikon and lemongrass. We like the fresh flavour of the fish here, along with the hearty seafood broth, which reminds us of what we had in Marseille few years ago. It is overall not too heavy, highly recommended if you are looking for something lighter for your mains as opposed to red meat. We had this for breakfast! Our nutritionists would definitely disapprove. Regardless, a good Bib Gourmand spot in Jurong for communal dining. Good morning! Thai iced tea kakigori? There are a few flavours on the menu at After You, and this version is not too bad! Totally digging this red curry with crab meat from Supanniga, one of the dishes we had which left an impression. There are many options on the menu, so it is best to come in groups of three or four. Can always trust on D’ark Coffee for a good brew, where the coffee menu itself warrants its own coffee bar space. Finally checked out the One-Michelin starred @Restaurant_Gaa in Bangkok, ranked Number 16 and the highest climber in this year’s Asia 50 Best! We went with an open mind, not knowing what to expect or what’s on the menu even before we made our reservations. Quite a number of dishes which are really original and creative throughout our dinner journey, with some hits and misses for us. In gist, the first half of the menu resonated better for us, with the portions of the Jackfruit mains being its Achilles heel. That said, Gaa is worth trying if you are in Bangkok and looking for an experience which is more adventurous. Come open minded as well! Swipe from left: Quail with fried chicken skin; Chicken liver with longan; Crayfish done two ways. Could very well do with another plate of this glorious roast pork belly! Have a belly good week everyone! Starting the day right! The surprise on the table here is the brownie, aptly named a ‘F******* Good Brownie’. Good morning! Yes, we know, don’t judge us! Not quite sure if we have overloaded ourselves this trip with what we feel is the best Shibuya Honey Toast. Don’t bother going for the baby size, which is 20 baht cheaper than the regular size!